Pomegranate oil is pressed from pomegranate seeds. 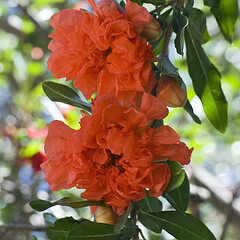 The Punica granatum deciduous tree has glossy slender leaves, bright red flowers and bears this edible fruit. Pomegranates are between the size of lemons to grapefruits. They have thick reddish skin with approx. 600 seeds. They're soft amber in color with a mild fruity scent. Some claim their scent is similar to melted chocolate. In the northern hemisphere, they're in season from September to February, in the southern hemisphere from March to May. Pomegranates have more antioxidants than cranberries, blueberries or green tea! Eat pomegranates within one to two weeks of purchase. Store in refrigerator, for extended use, up to one or two months. They should only be left at room temperature for up to two to three days. Discard all spoiled fruit, since bacteria sets in, causing digestive problems. CAUTION! Pomegranate fruit is safe to eat when consumed in moderation. An overdose of its seeds, oil, juice or extract can cause diarrhea or upset stomach. Rare cases may involve fruit allergies. Contact your health care provider, immediately, and discontinue use if you notice any of these symptoms: itchiness, swollen tongue or lips, difficulty swallowing or breathing. Pomegranate is skin healthy. It's anti-bacterial, anti-inflammatory and anti-aging. Its seeds contain a juice with ellagic and punic alagin, that fight damage from free radicals and preserve skin collagen. It's a powerful source of phytonutrients! Pomegranate is beneficial for many skin conditions: acne, dry, irritated, aged, psoriasis, eczema, sun damaged, dull or inflamed. Pomegranate oil is unrefined with cosmetic and medicinal properties. It helps improve overall complexion buy penetrating skin, deeply, leaving a healthy glow. ANTI-AGING SECRET: (By Paula Abdul) Eat a half cup of pomegranate seeds each day to satisfy cravings with nutritional benefits. Avoid staining hands by submerging pomegranate in a bowl of water and break open to remove its seeds. Pomegranate seeds are low in calories packed with phytonutrients. They can help skin look radiant and youthful. HOMEMADE FACE MASK: Cut or break open pomegranate to expose seeds. Remove seeds and place in container. Spread seeds over face, avoiding eyes. Leave on for approx. 15 to 20 minutes. Rinse with warm water. Gently pat dry. PARADISE SMOOTHIE: (By Keri Glassman, R.D.) Place 1 medium ripe peach, (sliced), 2 tbsp. Hass avocado, (chopped), 1/3 cup unsweetened frozen strawberries, 3/4 cup fat-free plain yogurt, 3 tbsp. 100% pomegranate juice, 1 tsp. grape seed oil and 1 tsp. pure vanilla extract into blender. Puree about 15 seconds or until smooth. Pour into a tall glass and serve with a tall straw. This smoothie recipe will help to improve overall complexion and reveal a natural glow. Use only a small amount of pomegranate oil in your soap recipes. It can be expensive, so use it sparingly. It takes over 200 pounds of fresh pomegranates to produce one pound of oil! It would help make an excellent facial bar. ▪ Coconut Oil – 20 oz. ▪ Palm Oil – 15 oz. ▪ Sunflower Oil – 8 oz. ▪ Evening Primrose Oil – 8 oz. ▪ Apricot Kernel Oil – 7 oz. ▪ Macadamia Nut Oil – 7 oz. ▪ Palm Kernel Oil – 5 oz. ▪ Castor Oil – 2 oz. ▪ Pomegranate Essential Oil – 2 oz. ▪ Pomegranate Fragrance Oil (FO) – 2 oz. ▪ Distilled Water – 23 oz. ▪ Lye – 10.3 oz. DIANE SAYS: "The process is the same as normal for making soap. I processed this as a crock pot hot process to get more of a benefit of the pomegranate juice & oil, (or so I feel anyway). After the cook, remove from the heat and add 2 Tbsp pomegranate juice concentrate, 2 ounces pomegranate oil, and 2 ounces pomegranate FO, incorporating thoroughly after each addition. I prefer lighter, more subtle scents. I am sure you could go heavier with the FO." DIANE SAYS: "Put in mold and let sit for 24 hours. Unmold and cut. You can use this soap right away. The longer it stays out to dry, the harder and better the bars get." The pomegranate soap, mentioned above, can be used right away because it was made using the hot process method. If you make it by the cold process method you would need to let it cure for 4 weeks before using. This particular soap recipe might react fast during the cold process method and volcano. This isn't a big problem, most of the time, only if it's bad enough to leave a void in the soap. However, adding pomegranate oil after cooking the soap would guarantee of having NO volcano effect. Diane's Pomegranate Beauty Bar Soap Recipe, mentioned above, yields approximately 25 bars of soap at 4 oz. each.